DALLAS, March 20, 2018 — The American Heart Association, the world’s leading voluntary health organization devoted to building healthier lives free of cardiovascular disease and stroke, has collaborated with Google to develop an augmented reality version of Hands-Only CPR training that launches today in the Association’s mobile App, My Cardiac Coach™. The project uses new augmented reality technology developed by Google to create a life-like environment for users to learn Hands-Only CPR. Users can give a virtual person Hands-Only CPR any time, any place using their compatible Android mobile device. By simply delivering compressions at the correct rate and depth in a gaming experience, players are rated on their performance and can try to improve their score. Each year, more than 350 thousand out-of-hospital cardiac arrests occur in the United States. When a person suffers cardiac arrest, survival depends on immediately receiving CPR. Currently nine out of every ten people who suffer out-of-hospital cardiac arrests die. The solution, designed to improve those statistics, is a commitment by the Association’s Center for Health Technology & Innovation (CHTI) focused on creating collaborations between the health and tech industries to deliver innovative solutions. This augmented reality Hands-Only CPR is among the first use of new Google technology. The augmented reality Hands-Only CPR was developed by Level Ex, a medical technology company that creates video games for healthcare professionals using the state-of-the-art in visual effects and video game design methodologies. The augmented reality Hands-Only CPR adheres to the Association’s evidence-based best practices for CPR. The new feature in the App opens with a survey of the user’s environment to locate a suitable, flat location to administer CPR, directs the user to kneel next to the victim and have someone call 9-1-1. The user is then guided on appropriate hand placement, as well as the rate of compressions, which are controlled by finger strokes on the mobile device. Music plays to guide the user to the appropriate compression rate. The user is directed to stop when the App indicates professional medical personnel have arrived. 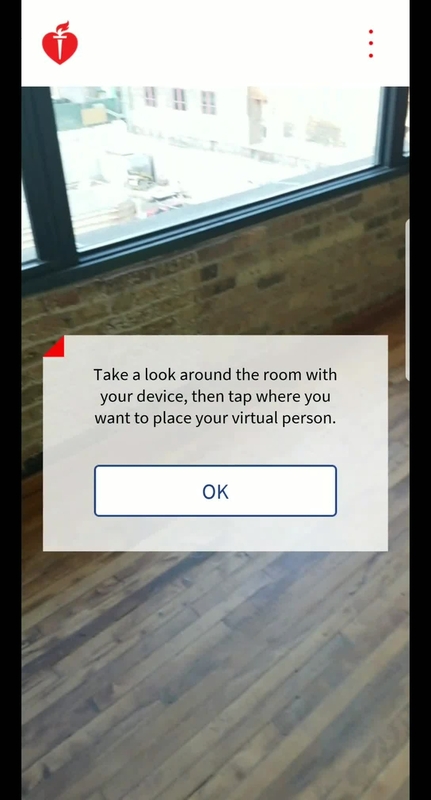 Google’s ARCore technology uses three main components to create augmented reality environments for this Hands-Only CPR training iteration: (1) motion tracking, (2) environmental understanding, and (3) light estimation which creates a life-like interface on a mobile phone. The augmented reality Hands-Only CPR feature is available within the My Cardiac Coach app and is only compatible with capable Android mobile devices. The My Cardiac Coach app is available for download on both iPhone and Android mobile devices. 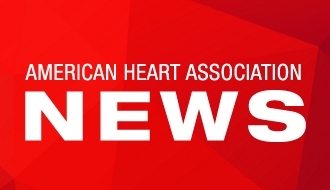 American Heart Association’s Hands-Only CPR campaign is nationally supported by Anthem Foundation, the philanthropic arm of Anthem Inc.
Downloadable images and a video of the App are available on the right column of the release link: https://newsroom.heart.org/news/new-augmented-reality-hands-only-cpr-makes-training-life-like-and-mobile. The American Heart Association is devoted to saving people from heart disease and stroke – two of the leading causes of death in the world. We team with millions of volunteers to fund innovative research, fight for stronger public health policies, and provide lifesaving tools and information to prevent and treat these diseases. The Dallas-based association is one of the world’s oldest and largest voluntary organizations dedicated to fighting heart disease and stroke. To learn more or to get involved, call 1-800-AHA-USA1 or visit http://www.heart.org/ or follow us on Facebook and Twitter. Example of Augmented Reality CPR Trainer on the My Cardiac Coach App giving instructions to, "Approach the person and kneel down next to them." Augmented Reality CPR Trainer on the My Cardiac Coach App start screen. Example of Augmented Reality CPR Trainer on the My Cardiac Coach App giving instructions to, "Always phone 911 before beginning CPR." Example of Augmented Reality CPR Trainer on the My Cardiac Coach App giving instructions to, "Approach the person and kneel down next to him." This video (with a music bed) is a walkthrough of the My Cardiac Coach App’s augmented reality feature showing graphically the steps to CPR as well as animations of the heart inside the life-like patient model. The American Heart Association developed the augmented reality Hands-Only CPR training App in collaboration with Google.